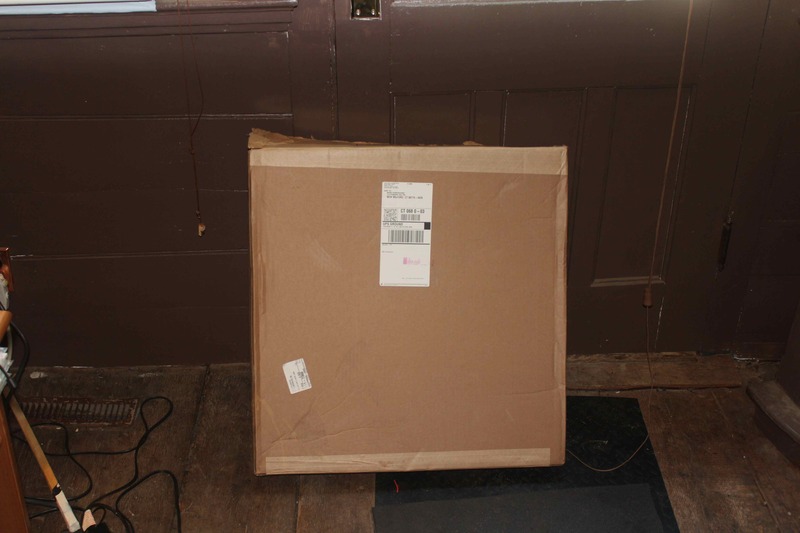 I did not post an essay this past Friday because a package arrived via the UPS guy. It was 25 inches square and three inches thick. Any guesses? Of course! The new rims to replace my worn-out MA 40. Do you notice something odd about these rims and/or look at the listing? That’s right; I went with tubulars for training. 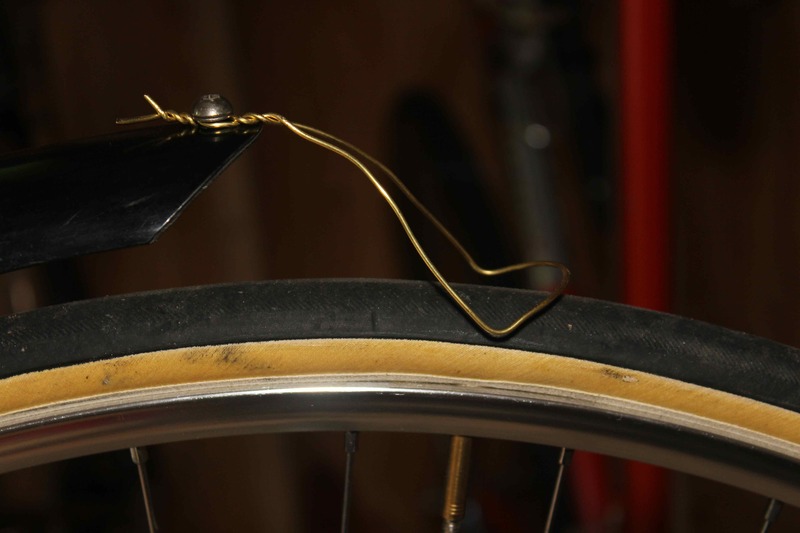 Tubulars stay in place by a combination of air pressure, when inflated, and a special glue applied to the rims. They have a reputation amongst cyclists these days for being tricky to mount, because of the glue, dangerous, if not glued properly, delicate, because the casing is not as tough and rigid as that on most clincher tires, and expensive, because you cannot simply change inner tubes after getting a flat. So, why did I choose to build this kind of wheel, if there seem to be so many disadvantages? First, it’s traditional. 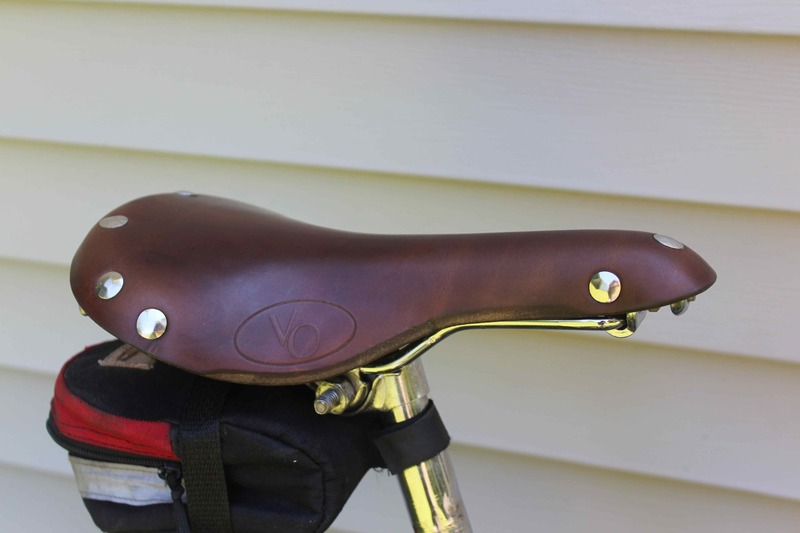 A vintage bicycle deserves to have the type of components for which it was designed, whenever this is possible. Second, I think they are easier and quicker to change if you get a flat. Instead of levering the tire off of its mounting bead, removing the damaged inner tube, checking the casing of the tire for the debris that caused the flat (I sliced my finger open quite badly doing this during a ride once), inserting a new inner tube, and coaxing the tire back onto the rim, you simply peel off the old tire and stretch the new one on in its place. Riding the brakes lightly for a few minutes re-melts and activates the dried glue, and you’re off. Third, tubulars feel good in a way that I cannot quantify. 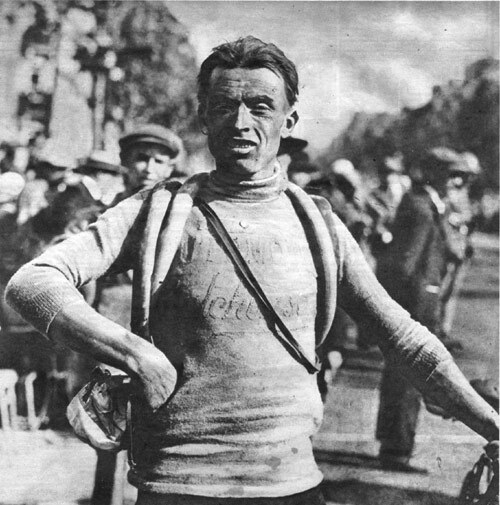 Riding on clinchers feels as though the bicycle will do as much as the effort you put into it, nothing more, nothing less. If the road is rough, you notice the friction. It’s pretty much a zero-sum-game. 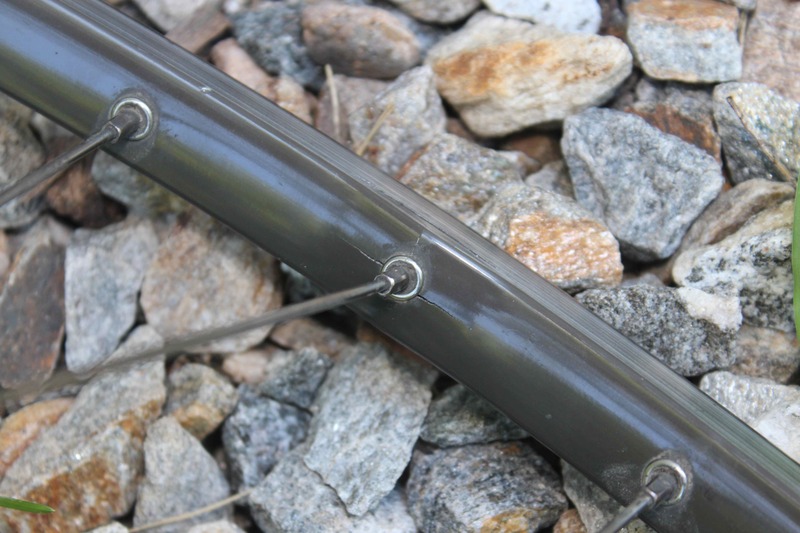 But when you have tubulars on the bike, there is a sense of riding on a coiled spring. It feels as though there is potential energy stored in the bike/wheel system, and the slightest touch on the pedals unleashes what the bike wants to do: take off. 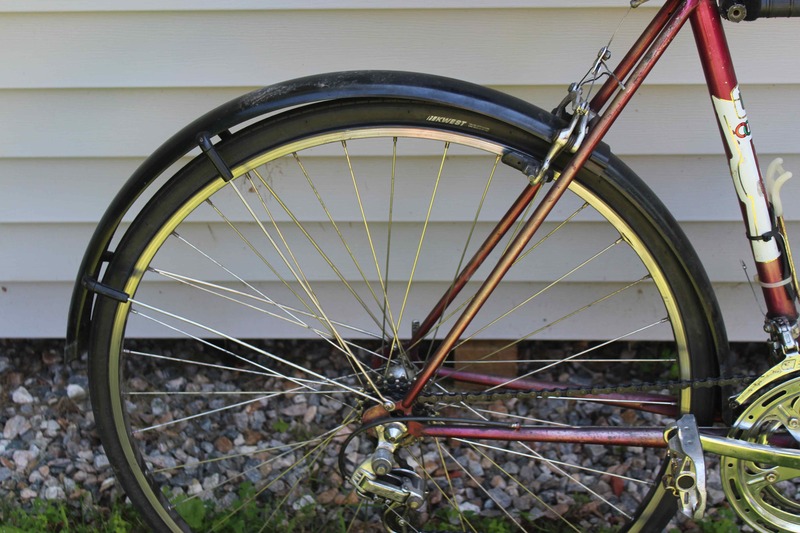 I know that the people who measure these things will say that, “These is no evidence that tubular tires have a lower rolling resistance than high-quality clinchers, blah, blah, blah.” All right, maybe not. But I’m telling you they just feel different. And better different, not just different. Fourth, and probably best of all, other cyclists have priceless reactions when I mention wanting to ride on tubulars. 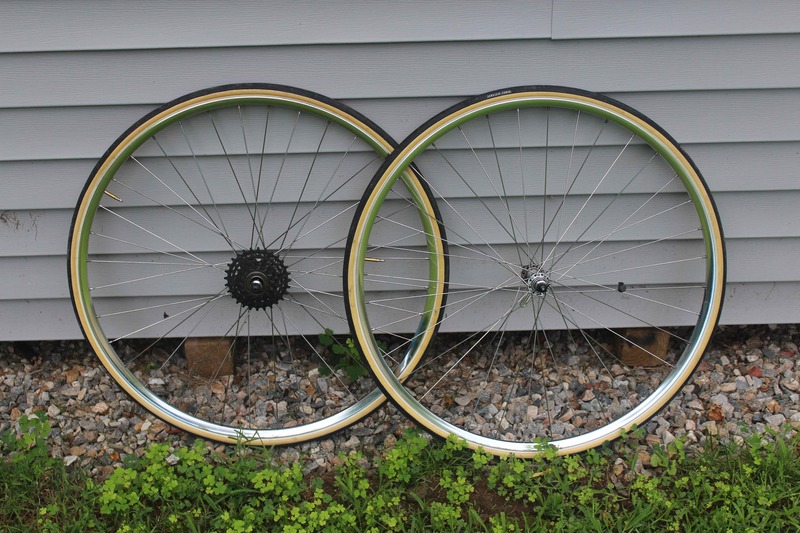 Before I found the rims on ebay, I was poking around in a shop that specializes in restoring vintage bicycles. 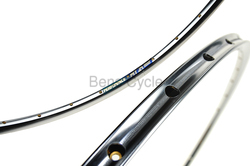 When I mentioned that I was looking for tubular rims, he looked at me with incredulity, and just said, “Clinchers!” When I talked to the owner of my local bike shop about my project, he asked if I knew what I was doing, and he did not mean building the wheel to be round, straight, and properly-tensioned. He meant using tubulars. People just cannot get their heads around the idea. 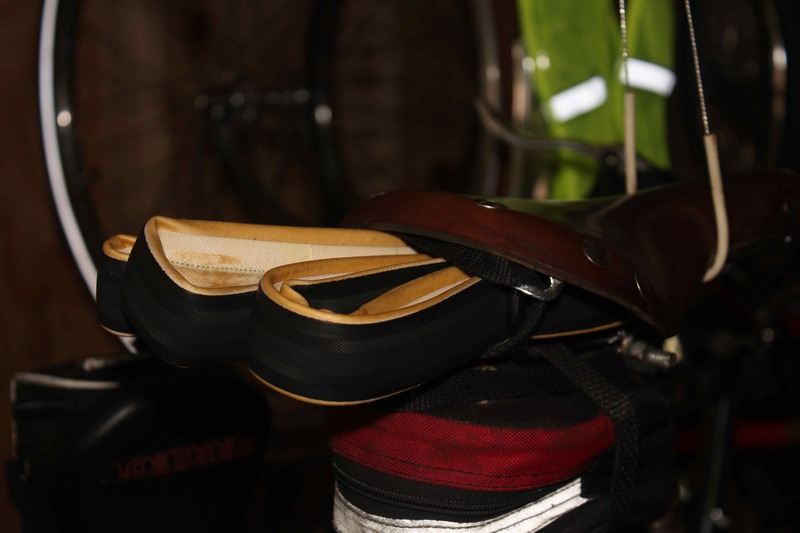 Look at this discussion, where an amateur in the United States criticizes European professional cyclists for using tubulars in the twenty-first century. Similar incredulity exists because professionals still use rim brakes and not disk brakes on their road bikes. These guys are the best in the world at what they do, and they make a living by riding bikes. But clearly they are mistaken in their choice of equipment. (Really?) I guess I just cannot understand why anybody gets so worked up about the equipment that someone else uses. If you want to use clinchers, carbon wheels, aerodynamic handlebars, and disk brakes, go ahead. It does not affect me in the slightest. But why do people feel the need to tell me I’m wrong for using what I want to use? I’m beginning to think that nobody today can think for himself. People look to others to justify their own choices. (Why do people in Massachusetts need to say they want their coffee “regular,” when they mean with cream and sugar? Because that’s the normal, correct way to take it, of course. So cream-only would be “irregular?”) If the social media say that everyone rides a certain kind of tire, then it must be true. There cannot be any deviation. This would make a cyclist unsure as to whether his purchasing decisions were correct. I think that, deep down, there is a fear in anyone who constantly follows trends and upgrades that he might have been duped. What if a guy on a steel bike rides faster than I do on my carbon fiber bike? 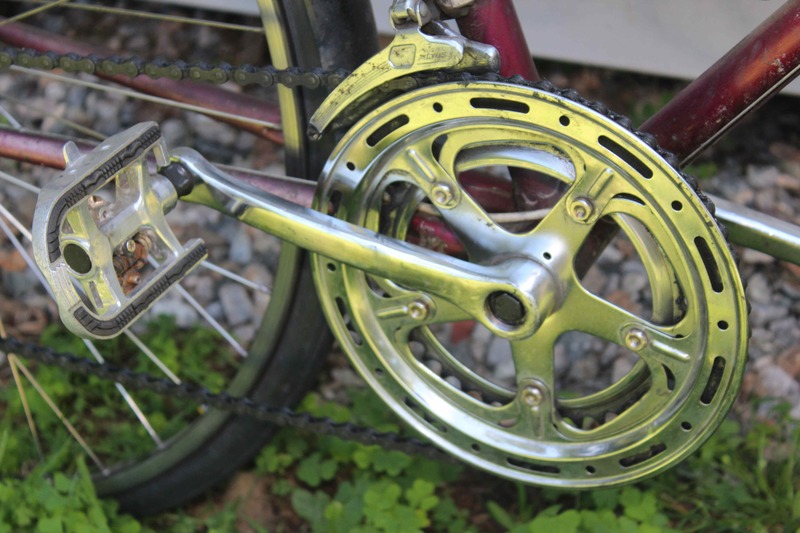 What if a guy with rim brakes can stop as well as I can with my disk brakes? What if a guy with a wooden tennis racquet can beat me and my hyper-carbon-oversized-widebody racquet? What if a guy with a telescope made of plumbing parts can find deep-sky objects and see them as well as I can with my GPS-enabled, computerized scope? So many people now equate performance with the purchase of new and “better” equipment that they seem unable to understand the two things are not the same. I cherish upsetting people’s worldview when I show up with my retro anything! Back to my story. Being the World’s Cheapest Human Being, I switched over the spokes and hubs from my old wheels (don’t worry; my local mechanic assured me they were safe), and carefully and slowly, over the course of last Friday, built my new tubular wheels. Over the weekend, I went for a shakedown ride and made some truing adjustments, and the wheels feel great! I look forward to upsetting cyclists everywhere when they see me using them. I know you’re probably getting tired of my writing about bicycling by now. But it is summer, the best time to indulge in the sport, and the Tour de France is still running. It’s on my mind for the time being. 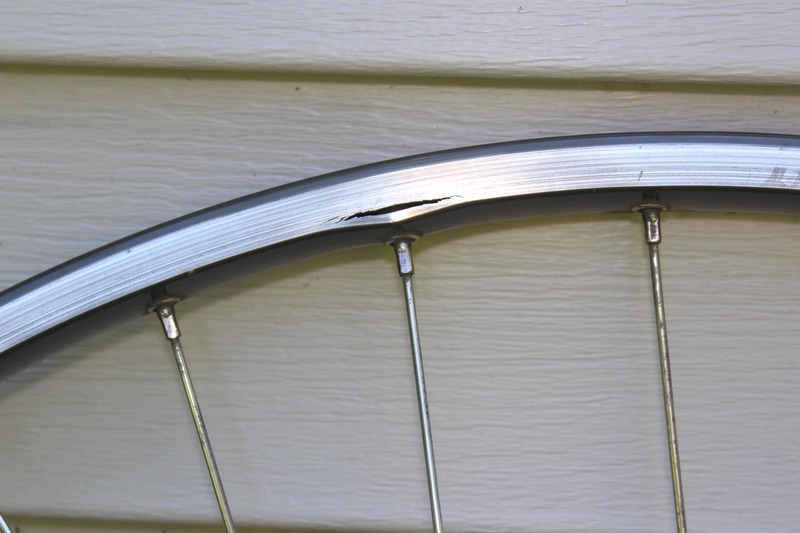 The other day while I was out riding, my back wheel did not feel quite right. There seemed to be a periodic thump that I felt more than I heard. 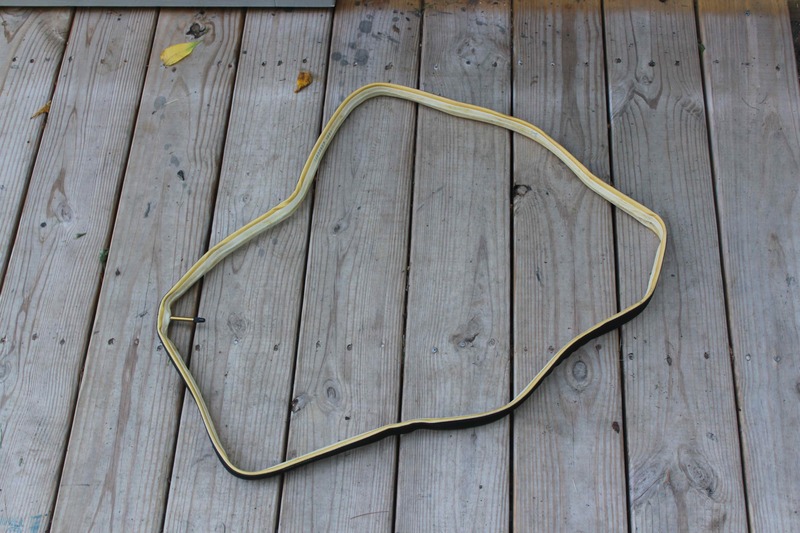 Sometimes this means a tire is losing air and becoming flat; sometimes it means the tire is not seated on the rim properly, and therefore has a low spot. I stopped briefly and checked the air pressure, which turned out to be fine. I spun the wheel, but did not immediately notice anything out-of-the-ordinary. I convinced myself that I was imagining the whole thing. I probably should not have felt a thrill at this point, but the wheel had not collapsed on the ride home, what with 35 other spokes holding it together. 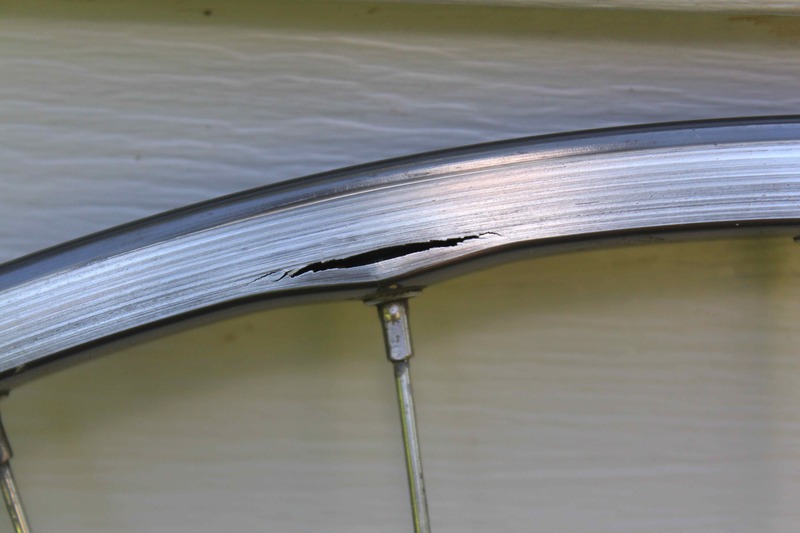 I had read in maintenance guides that rim wear was potentially dangerous, and now I had seen firsthand how the situation played out and how long it had taken. That’s right. Until yesterday I was riding on an MA 40. I know I had this wheel built before I graduated from college, and that was 1992. So that’s at least 23 years, and I rode it anywhere from 1,000 to 4,000 miles each year, depending on whether my interest in training was at a low or high point. I guess I really have not changed since my starving student days. I mean that rim owed me absolutely nothing. It gave me everything it had to give. Greater love hath no component that to give its life for the rider. Are you sure? Let’s examine that a bit more deeply. To do so, I’ll take you on a tour of the bike that I ride the most. A friend gave me this bike when his parents were cleaning out their garage. 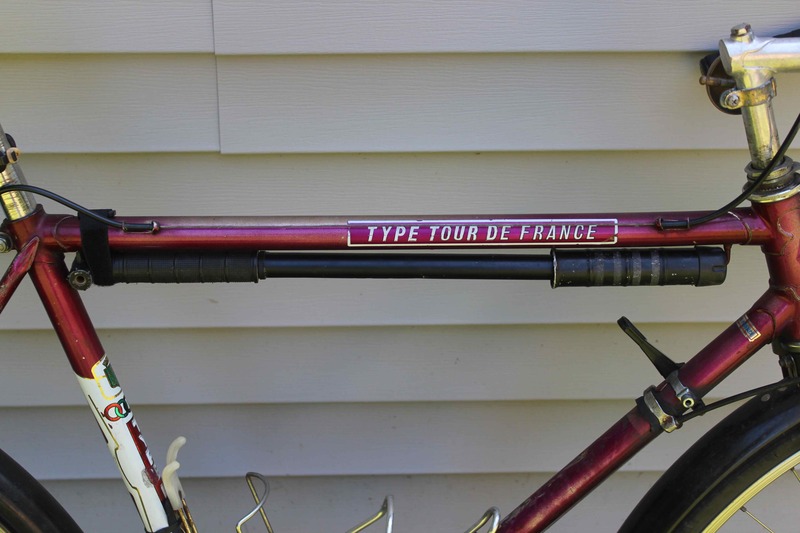 It has no brand name anywhere on it, but, based on some similarities to another frame I own, I believe it to be a St. Etienne. 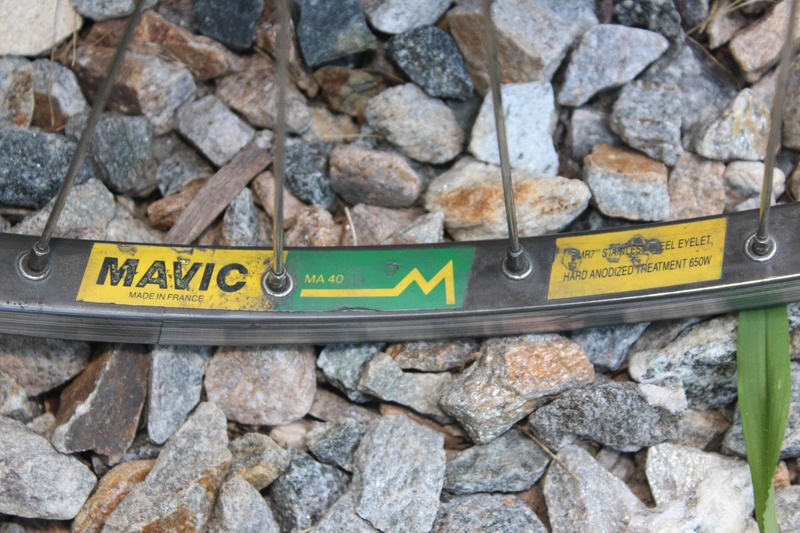 According to guru Sheldon Brown, this was a middle-of-the-road brand imported into the United States during the “bicycle boom” of the 1970s. 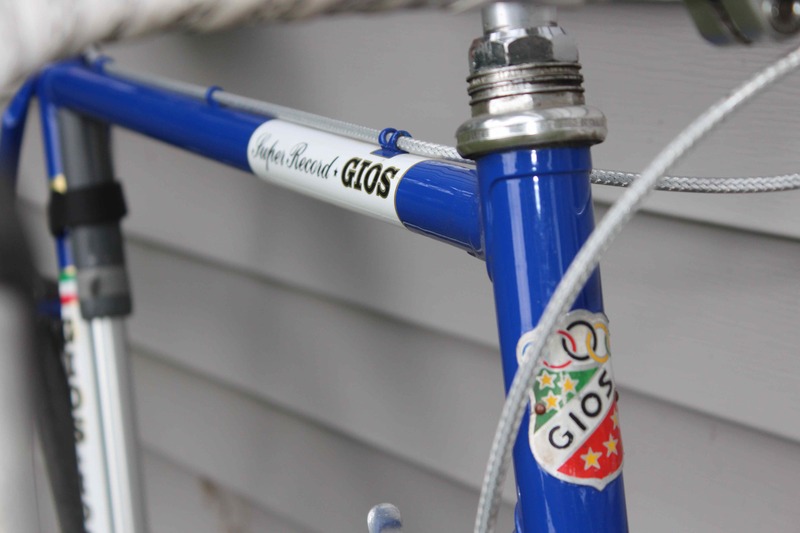 It was built in 1973, and I guarantee that “TYPE TOUR DE FRANCE,” on the top tube decal, had nothing to do with racing. This is a lugged steel frame, with 72 degree head and seat tube angles. 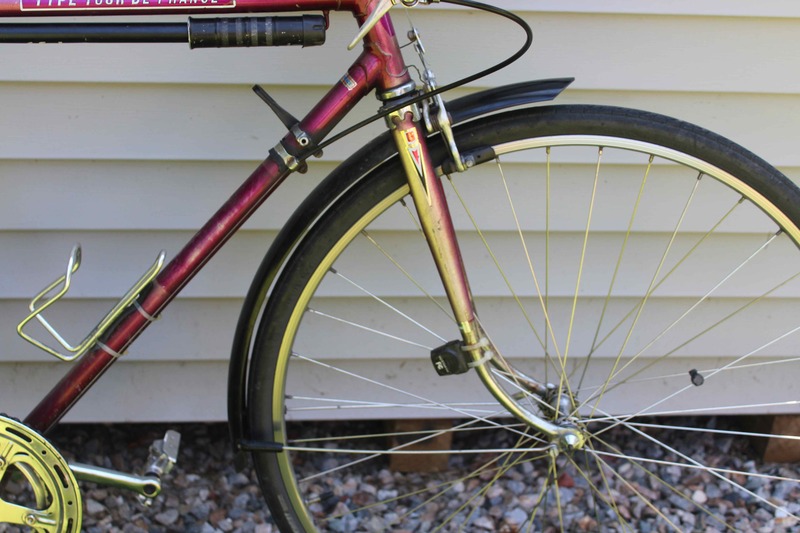 As you may know, this means a super-comfortable ride, because the shallow angles and steel tubing absorb much more road shock than anything made today. I have changed some of the components to give even more comfort. 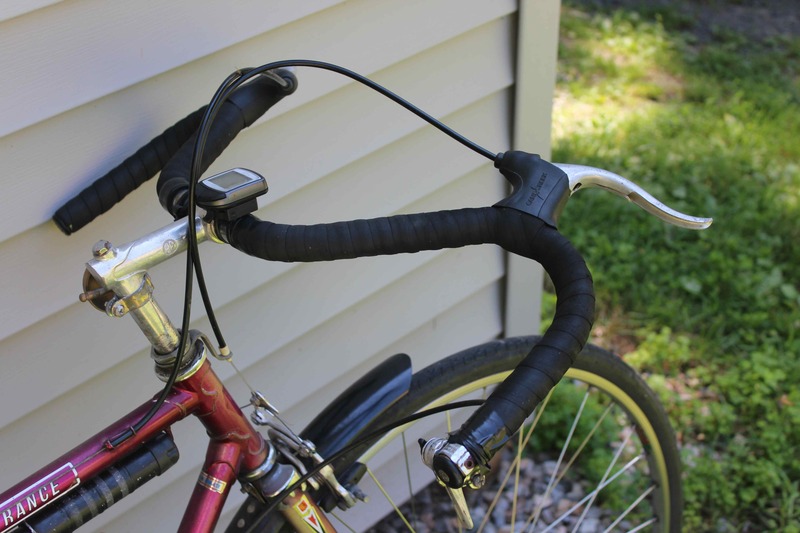 Those are moustache-shaped handlebars which put your hands and arms in the best possible position for climbing. And, in case you haven’t guessed already, they’re made of steel! 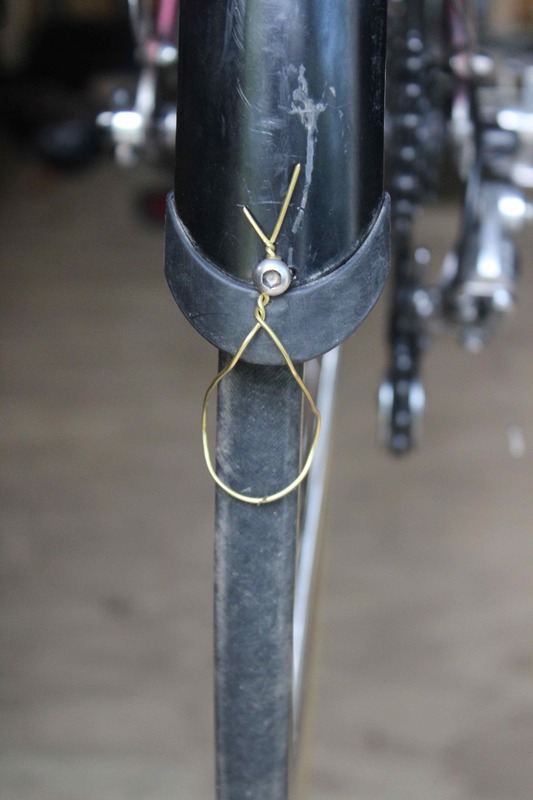 Why bother with a suspension fork or stem? full fenders, because it rains and snows a lot where I live. 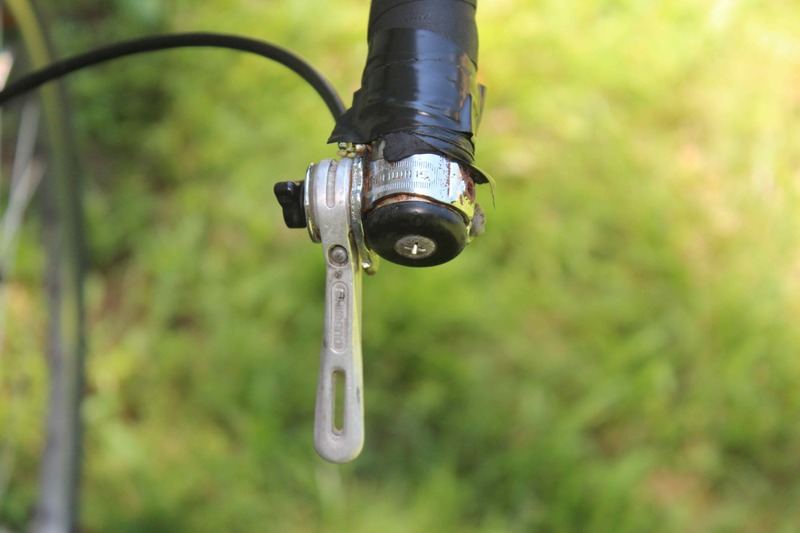 full-size frame pump, because nothing else works as well. my 19 lb. bike with 74 degree angles and tubular wheels. It’s probably still a lot heavier that what you’re riding, but to me it will feel insubstantial. 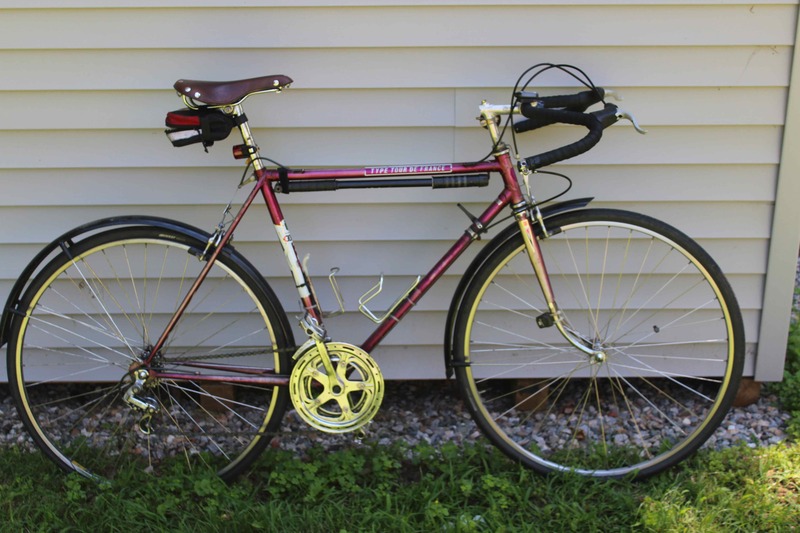 Whenever other cyclists see me on my purple monstrosity, they feel the need to comment on my “commuter” bike, and show off their race-worthy machines. They should remember, though, it’s the engine that matters. I might just be faster after all.